Batman #63 Review – AiPT! Relive the Bat and Cat happy ending wedding. It is quite clear Batman is going through a psychological crisis. The last issue was trippy and it pushed Batman mentally and pushed the reader to make sense of what was going on. He’s reeling from a reveal that people are still talking about cough-his dad-cough and that anguish continues this week. Can Batman get his head in the game? After reading this issue the answer is…maybe? There are strange goings-on in the dark alleys of Gotham City, mysteries that will require a different skill set than the Caped Crusader’s if he’s going to stop the whole city from succumbing to the darkness. John Constantine, the Hellblazer, is a person with just those skills–but after the events of “The Witching Hour,” is Constantine in any condition to help the Dark Knight Detective? Were you a fan of the Bat and Cat wedding issue? Buckle up, the events of that issue come full circle here, pushing Batman into a dream that, like the last issue, may just be a nightmare. If you were upset with Catwoman standing Batman up on their wedding day, you may love this issue. It’s not too much of a spoiler to say this issue reveals what their married life would be like. 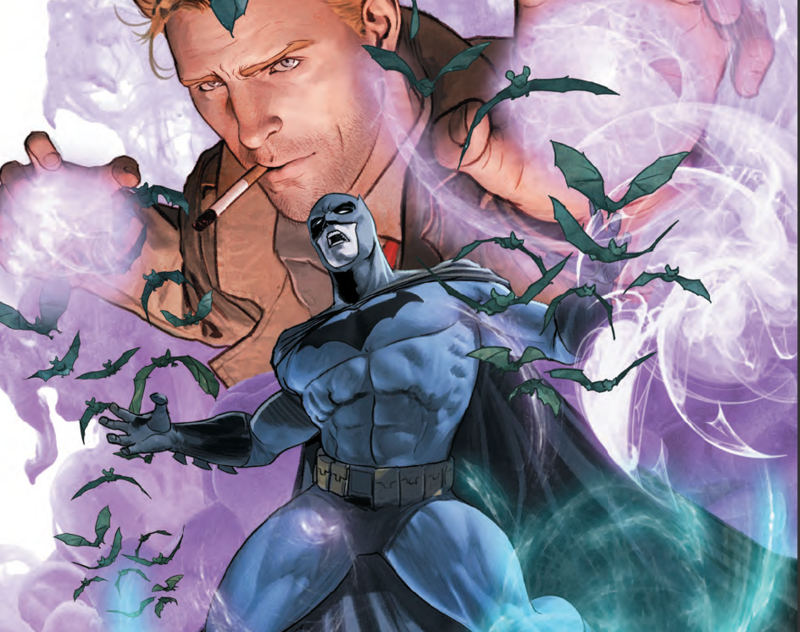 Constantine is integrated well, sort of ghosting Batman and trying to talk sense into him. As the issue carries forward Batman’s happy ending, it becomes clear things aren’t as they seem and are probably very bad. This issue also appears to give readers a concrete answer as to what was going on the last issue and in this one. Answers people, finally! Mikel Janin draws this issue with perfect inks to highlight the cape, cowl, and darkness inside Batman. I had to read the last page more than once because the layout design was so good. Instead of left to right, it goes left to right to bottom to top to bottom to top, if that makes sense. It’s a neat little play that bounces around nicely in a dramatic moment. Good use of repeating panels helps convey good visual timing and pace, and there is genuine human emotion in endearing scenes. Oh, and fans in the know are going to love a Batman punch that has to be an homage to a famous meme. Bravo on that one, Janin. It’s hard to shake the feeling this issue and the last issue are stretching this narrative out. An emotional toll is being taken on Batman and something heavy is going on, but it is being delivered in a decompressed package. In single issue format, it reads like we’re getting a snippet of the bigger story rather than a fully entertaining 20-page story. Depending on your patience and how much you expect from a single issue read, it can be disappointing. A good issue that offers answers in a compelling and sometimes emotional issue. Some concrete answers at last!